We’d love your help. 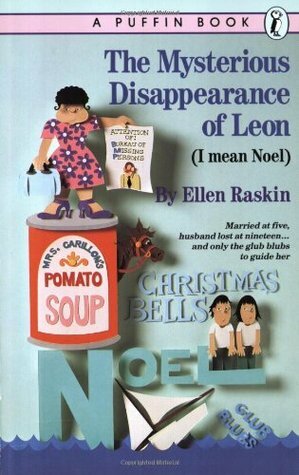 Let us know what’s wrong with this preview of The Mysterious Disappearance of Leon [I Mean Noel] by Ellen Raskin. To ask other readers questions about The Mysterious Disappearance of Leon [I Mean Noel], please sign up. The Mysterious Disappearance of Leon (I Mean Noel) is an amazing book that can be equally enjoyed by adults and children alike. Adults reading the book see more layers to it than the kids, but the read is just as mysterious and enjoyable (although the idea of marriage at that young an age will be a squicky one). If you have read Ellen Raskin's Westing Game, and even if you haven't, this is a book you really need to get your hands on. I've read some of her other books, but absolutely nothing compares to these two classics. This one comes fully equipped with hysterical characters and plenty of footnotes. It's adorably quirky without trying too hard. Every thing, every hilarious incident, is narrated casually and in a way that just makes it all funnier. Everything is so tantalizingly cryptic, and at times, downright confusing, but it's a huge relief when everything really falls into place and you realize that every event that was narrated is somehow connected to the big picture scheme. Other than all that, it's a very readable book. The chapters are divided up into small sections and just style-wise, it's an easy but really worthwhile read. It really emphasizes the reason why we love Ellen Raskin so much--plot twists and surprises everywhere! The other really nice thing is that the mystery is not at all obvious. Nobody would ever suspect the outcome, but it's such a compelling one! It's got snark, puzzles, humor, definitely not just a kids' book. It is also really nice, at the end, to get closure from all of the characters, so I do appreciate it when authors like Raskin do things like that. 3.5 stars. This is not as good as The Westing Game, but has much the same sort of humor, if I remember correctly. A favorite. This book progresses in just the right way. I was fascinated by the word-people when I first read it as a kid, and this time I could clearly see in my mind's eye how this story would read as a film! Oh how dramatic the Glub-Blub scene would be! Mrs. Carrillon kneeling on flotsam, Leon (I mean Noel) sinking into the ocean, "Noel glub C blub all. I glub, new..." And WHAM! Yardarm to the noggin. It's such a sweet story of people who find they loved each other all along. Additionally, the A favorite. This book progresses in just the right way. I was fascinated by the word-people when I first read it as a kid, and this time I could clearly see in my mind's eye how this story would read as a film! Oh how dramatic the Glub-Blub scene would be! Mrs. Carrillon kneeling on flotsam, Leon (I mean Noel) sinking into the ocean, "Noel glub C blub all. I glub, new..." And WHAM! Yardarm to the noggin. Additionally, the lessons learned from the story helped me against bullies in junior high once, when I was chased from the lunchroom across the street to the seminary building by some obnoxious girls who were asking me what kind of underwear I wore. For a shy shy kid, this was too much to bear, and I ran rather than answer them. However, just as I got to the front door of the seminary building I remembered Mrs. Carrillon's personal preference, and turned to face the girls to repeat one of her best lines, "I don't wear underwear - I wear purple-flowered bathing suits!" Amusing, lighter fare from Raskin. The puzzle mystery in this one revolves around solving the "glub-blubs," that is, filling in chunks of a sentence that were swallowed by the ocean as a mysterious person drowned while trying to communicate a secret message to Mrs. Carillon. She is assisted in her detecting (solve the riddle, find her missing husband) by twins Tina and Tony and the gentle Augie Kunkel. Charming. Ellen Raskin was one of my favorite authors when I was in elementary school. I kind of thought her books would get less disturbing as I got older, but...no. I first read this when I was in 6th grade (I'm 36 as of this writing and still read this every once in a while!). Titles are often times the first thing that grabs me when I browse for a book, and this title was no excecption! This is the first fiction book I read that included unusual footnotes and typography, leading to admirations of David Foster Wallace, James Joyce, and other experimental writers. The fascination with words and symbols were also a plus for me. It's a fast and funny story tha I first read this when I was in 6th grade (I'm 36 as of this writing and still read this every once in a while!). Titles are often times the first thing that grabs me when I browse for a book, and this title was no excecption! But it was sweet. The end. Leon and Caroline are married at the age of 5 in order to ensure an alliance between their families. Leon is promptly shipped off to boarding school and they only communicate via letters until they are nineteen. They meet in Florida and go on a boat ride. The boat is immediately capsized and as Leon (who has changed his name to Noel) flounders in the water, he relays a mysterious message to Mrs. Carrillon. When she wakes in the hospital, Noel is gone and she must embark on a mission to find her missing husband. Along the way, she meets new friends and never changes her dress style so that Noel will always be able to recognize her. This book is great for kids. However, it's a mystery with some clues that even I got annoyed with. No, I'm not saying my age, but suffice to say, I'm not a child. There's some great wordplay that will teach kids about English and they'll get to solve a mystery. And I think the characters are very likeable. I have been trying to figure out what this book was called for years- I could only remember the cover, and that I checked it out multiple times in grade school. I was looking up what other books Ellen Raskin wrote, and there it was!! It was as zany as I remembered, and it was fun to read through it again! Great fun to read! It is too much fun to be just for kids. An awesome, funny read. Suffers a bit from dated attitudes towards women and children (two of the main characters get married at 12?!? ), but overall, it still holds up. plot, so I was as eager as the boys to see the puzzle of Leon solved. I will have to definitely read more Raskin with them. The writing style does not work for me but I do think the mystery is rather good, albeit having some cumbersome explanation in the middle. As a whole it will probably captivate a younger reader so for once even though I usually think adults should be able to enjoy a good middle grade book, I think young audience will appreciate this book more than I do. I remember my sixth grade teacher reading this to us. She started crying, she was laughing so hard. Fun book with a classic 70's feel. Definitely will be reading this one to my kids. Highly recommend for kids and adults! Holy Guacamole! I don't even know what to say except, WOW! Ellen Raskin just has this quirky magic in all her books! I love her odd but fitting names for everyone such as Mrs. Baker (took me a bit to get that one), Mr. Banks and so on. And of course her and her struggling artists. Tina also reminded me of Turtle in Westing Game. This book was kind of sad. It was also happy. It just sort of drew me in from page 1 and then half way through I was wondering why the heck this book wasn't wrapping u Holy Guacamole! I don't even know what to say except, WOW! This book was kind of sad. It was also happy. It just sort of drew me in from page 1 and then half way through I was wondering why the heck this book wasn't wrapping up when KABOOM! Everything was happening at once. They solve the case! Not only that but the case was different than what we were led to believe throughout the book. Some of their logic doesn't make sense, but it's fine because it's by Ellen Raskin. It is truly entertaining. This book also made me laugh out loud a few times. And might I say that every little thing ties together. Something mentioned that might seem random is a key part of the plot or something that comes up later. I always get this feeling whenever I have read the Westing Game, The Tattooed Potato and other Clues, and this that when she mentions a name it is out of the blue but then later that name is brought up again and I have a hard time recalling when she had mentioned them before. That is why her books are such great mysteries, they are hardly predictable because they are so outrageous but at the same time not. Despite this being a middle-grade book I found it to be profoundly sad. Yes, it deals mainly in clever clues and childish jokes but the real core of this novel is horribly heartbreaking. - Her parents force her to marry a boy. - Her new husband gets sent away. - She lives with a horrible nanny who abuses her. - When she finally is reunited with her husb Despite this being a middle-grade book I found it to be profoundly sad. Yes, it deals mainly in clever clues and childish jokes but the real core of this novel is horribly heartbreaking. - When she finally is reunited with her husband at a hotel, she hits her head when their boat capsizes and he goes missing. - She spends the next 20 years searching for him. - It turns out the man she met at the hotel was not her husband, but her husband’s friend. - The man who is her husband dies the same day she finds out who he is and that he was alive and well the whole time. This book has a clever and well-thought out plot. However, I cannot get over the injustice of what happened to Mrs Carillon and how it could have all been avoided. No happy ending can take away from how bad I feel that (view spoiler)[she spent 20 years of her life dutifully searching for a man who was prancing around with blonde girls and horses and had abandoned his wife because he thought he wouldn’t be good enough for her. They got married when they were literally children so it’s understandable they might not want to stay in the marriage. But he didn’t even have the courage to tell her to her face that he couldn’t be with her. It's a quirky and surreal tale of a woman who spends her entire adult life searching for a man named Noel (or Leon) who drowned (possibly) in Florida. The bulk of the book consisters of Mrs Carillon and her two adopted twin orphans, Tony and Tina, trying to make sense of the last words of Leon/Noel. And because his last words were half-uttered underwater, they essentially have a classic 'fill in the blanks' word puzzle to solve. Which brings us really to what people love about Ellen Raskin. Even though she was writing before computer games - and even Choose Your Own Adventure books for that matter - her books are puzzles. She invites the reader to solve the mystery as they read and that's what makes them so much fun. I read this as a kid a BUNCH of times and thought it would be fun to read it again. The puzzles are fun but I don't think the book holds up all that well for this day and age. Still, I imagine a kid that like solving puzzles might like it. Funny, I didn't remember much of it at all or the solution. I would rate this as either a 3 or 4 for a kid and a 2 or 3 for an adult. Fun book but I bet there are more modern takes on it now (and also since society has changed greatly since this book was writt I read this as a kid a BUNCH of times and thought it would be fun to read it again. The puzzles are fun but I don't think the book holds up all that well for this day and age. Still, I imagine a kid that like solving puzzles might like it. Funny, I didn't remember much of it at all or the solution. I remember loving this book as a kid. I *did* still love it, although I had some different emotions about the characters (in particular how women are depicted - I know it's an older book, but I felt for Mrs. Carillon and wanted to tell her, 'girl you are more than just Leon (I mean Noel)'s wife!'). But it's a fast read and the mystery is cute and Augie Kunkel is a true gem of a human and there's a lot of talk about horses and sea otters. Many of my childhood favorites sadly did not stand the test of time and were not appreciated by my own kids. The good news is that this book seems as fresh and quirky as ever and my 11 year old son really enjoyed it. I only wish they had kept the old crazy purple cover! One of my life-shaping childhood favorites, as were several of her books. The first author it occurred to me could be alive, only to look her up, as I worked in a children's room at the library, to find she had died recently, too young. What a weird book, but fun, but weird as an adult. I think the kids enjoyed it more than I did, but it was pretty great. The scene with the bathing suite still had me laughing. I am glad my children love to read and this is just one of the many crazy things we enjoy. I don't know what I was expecting but I didn't like this very much. It reminded me of the Maurice Sendak nutshell library stories, which I feel a fondness for because of Carole King and having read them in childhood. Maybe if I'd read this for the first time as a kid. Hilarious. I highly recommend for a fun read with many characters interweaving an unlikely complex plot. Ellen Raskin was a writer, illustrator, and designer. She was born in Milwaukee, Wisconsin, and grew up during the Great Depression. She primarily wrote for children. She received the 1979 Newbery Medal for her 1978 book, The Westing Game. Ms. Raskin was also an accomplished graphic artist. She designed dozens of dust jackets for books, including the first edition of Madeleine L'Engle's classic A W Ellen Raskin was a writer, illustrator, and designer. She was born in Milwaukee, Wisconsin, and grew up during the Great Depression. She primarily wrote for children. She received the 1979 Newbery Medal for her 1978 book, The Westing Game. Ms. Raskin was also an accomplished graphic artist. She designed dozens of dust jackets for books, including the first edition of Madeleine L'Engle's classic A Wrinkle in Time. She married Dennis Flanagan, editor of Scientific American, in 1965.